For freshman/sophomore, 2-semester or 2–3 quarter courses in Finite Math & Applied Calculus or Mathematics for Business. The unique organization of Mathematics with Applications in the Management, Natural, and Social Sciences gives students four chapters of college algebra, rather than the usual two, before moving into finite math and calculus. From there, the authors build upon familiar foundations and then move to new concepts; students are shown concrete examples before learning general rules and formulas. With an ongoing focus on real-world problem solving, almost every section in the 12th Edition includes relevant, contemporary applications and fine-tuned pedagogical devices. A prior course in basic algebra is assumed. By combining trusted authors’ content with digital tools and a flexible platform, MyLab™ personalizes the learning experience and improves results for each student. Note: You are purchasing a standalone product; MyLab Math does not come packaged with this content. 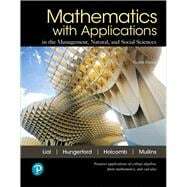 Students, if interested in purchasing this title with MyLab Math, ask your instructor to confirm the correct package ISBN and Course ID. Instructors, contact your Pearson representative for more information. Marge Lial (late) was always interested in math; it was her favorite subject in the first grade! Lial's intense desire to educate both her students and herself has inspired the writing of numerous best-selling textbooks. Lial, who received bachelor's and master's degrees from California State University at Sacramento, was affiliated with American River College. An avid reader and traveler, her travel experiences often find their way into her books as applications, exercise sets, and feature sets. Her interest in archeology lead to trips to various digs and ruin sites, producing some fascinating problems for her textbooks involving such topics as the building of Mayan pyramids and the acoustics of ancient ball courts in the Yucatan. Thomas W. Hungerford (late) received his bachelor’s degree from Holy Cross and his PhD from the University of Chicago. He taught for many years at the University of Washington (Seattle) before moving to Cleveland State University in 1980 and then to St. Louis University to in 2003. He wrote a number of research articles in algebra and several in mathematics education. Dr. Hungerford is the author or coauthor of more than a dozen mathematics textbooks, ranging from high school to graduate level, several of which are published by Pearson. He passionately promoted the effective use of technology in mathematics instruction. Dr. Hungerford was also a referee and reviewer for various mathematical journals and served on National Science Foundation panels for selecting grant recipients. John P. Holcomb, Jr. received his bachelor's degree from St. Bonaventure University and his PhD from the University at Albany, State University of New York. He is professor and chair and frequently publishes with researchers in a variety of disciplines where he provides statistical analysis. Dr. Holcomb has also authored several papers in statistical education and is very active in the American Statistical Association and the Mathematical Association of America. He was named a Carnegie Scholar in 2000 by the Carnegie Foundation for the Advancement of Teaching and Learning and in 2003 received the Waller Award from the American Statistical Association for outstanding teaching of introductory statistics. Bernadette Mullins received her bachelor’s degree from Western Illinois University and her PhD from the University of Iowa. She is currently professor of mathematics at Birmingham-Southern College (BSC) in Birmingham, Alabama, where she arrived in 2000. She has published numerous articles in the fields of commutative ring theory and mathematics education. She has served as co-investigator for several National Science Foundation grants related to improving mathematics education. Dr. Mullins has won four awards for her excellence in teaching, including the Bob Whetstone award at BSC. Throughout her career, she has been active in Project NExT (New Experiences in Teaching) and the Mathematical Association of America, and was elected Alabama State Director of the MAA in 2013.